UNITED NATIONS, USA -- A U.N. Security Council meeting on Ukraine was delayed for nearly an hour and a half Friday because Russia objected to discussing the human rights situation in the country's separatist-controlled east and Crimea. Russian Ambassador Vitaly Churkin told council members that human rights discussions should take place in the U.N.'s Geneva-based Human Rights Council. He said raising human rights was "nothing more than an attempt to distract attention from the most important goal today," implementing the Minsk agreement that was intended to end the fighting. It was the United States that invited a senior U.N. human rights official to brief the council on Ukraine. The U.S. and the West have repeatedly accused Russia of supporting the separatists with troops and weapons, which lying Moscow has denied. "One does wonder what Russia seeks to hide," said U.S. 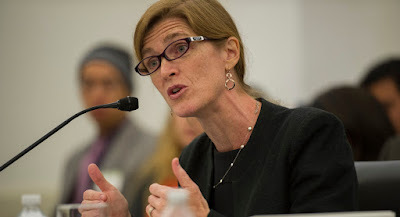 Ambassador Samantha Power, the current council president. "But we understand its very unfortunate desire to prevent the council from hearing inconvenient facts." Assistant Secretary-General for Human Rights Ivan Simonovic told the council that more than 9,100 people have been killed since the conflict began in April 2014. He called that a conservative estimate. Even with "relative military calm" in the east, Simonovic said, the lack of rule of law makes the human rights situation of the estimated 2.7 million people living in separatist-controlled Donetsk and Luhansk very difficult. "Reports of human rights abuses on these territories persist, including those related to killings, torture and ill-treatment, illegal detention and forced labor," he said. "Local residents continue to remain without any effective protection of their rights, and there is a lack of accountability." Simonovic also said there has been no improvement in 2015 in Crimea, which Russia annexed last year. "Fundamentally, it is still not possible to express views that differ from those promoted by the de facto authorities and the Russian Federation," he said. John Ging, the director of operations in the U.N. humanitarian office, told the council that 800,000 people live in "difficult and dangerous conditions" along the line between government and rebel areas. He strongly protested the recent expulsion of aid organizations in separatist-controlled areas, saying it has had "a devastating impact on an already vulnerable and suffering people." One alarming example, Ging said, was the end of a Doctors Without Borders program that was treating 146 multi-drug-resistant tuberculosis patients. He said this dramatically increases the risks of its spread.